Living Library with Asian-Canadian Twist! Admission: Free, but please register at Eventbrite. A Living Library Program makes people—rather than books—available for checkout. In the Asian Library context, such a program would provide a space for distinguished individuals who have Asia-related experiences or backgrounds to make connections with students and community members. The overall theme of the program is to raise awareness of diverse groups and perspectives. For our pilot event, we plan to invite 5 “human books,” as well as approximately 15 “readers.” After a short introduction, each “human book” will be matched up with up to 3 “readers” for a 20 minute discussion. Topics will vary depending on the questions from the readers. After approximately 50 minutes of introduction and discussion, all participants will gather for mingling and snacks. Discussions may take place in English or Asian languages, depending on the language proficiency of those participating in the discussions. 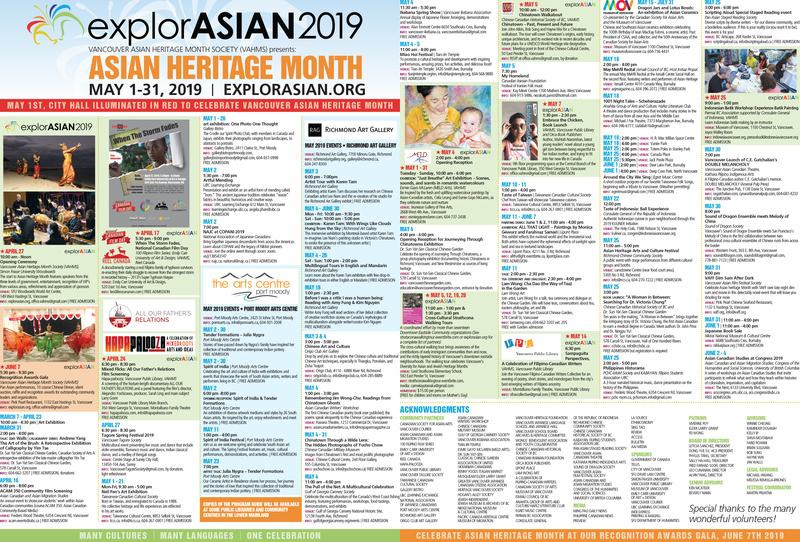 This program will provide library participants with the opportunity to gain a greater and deeper understanding of the Asian culture and social diversity within Canada. It will serve as a venue to learn, exchange ideas, and forge new connections with those in the community as well as those in the university. Below are just a few “Living Books” that will be featured at the event! Born and raised in Hong Kong, Simon was educated in Canada at McMaster University ‘72. He did post graduate theatre studies in New York, worked as an artistic director, director and award winning playwright. He is Gateway Theatre’s Artistic Director Emeritus in Richmond B.C. and lives in South Surrey, B.C. Canada. Simon is the author of numerous plays produced and published in Canada. He won Theatre BC’s National Playwrights prize, the City of Richmond’s Cultural Leadership Award, McMaster University’s Alumni Gallery and is the Gateway Theatre’s Artistic Director Emeritus. He was born and raised in Hong Kong then immigrated to Canada where he graduated from McMaster University. After postgraduate studies in New York he returned to Ontario and has worked continuously in Canadian theatres as an artistic director, director and playwright. Simon lives in South Surrey, B.C. The House of Wives is his latest novel. Jeongeun Park is a Postdoctoral Research Fellow at the University of British Columbia. She earned her MA in Religious Studies at the University of Alberta in 2008. She received her PhD in Asian Studies from the University of British Columbia in 2016. Her PhD dissertation entitled “Clerical Marriage and Buddhist Modernity in Early Twentieth-Century Korea” showed that the practice of clerical marriage among Korean monks during the Japanese colonial period was a phenomenon of Buddhist modernity. Her recent research focuses on Buddhism and violence during the Buddhist Purification Movement in South Korea. 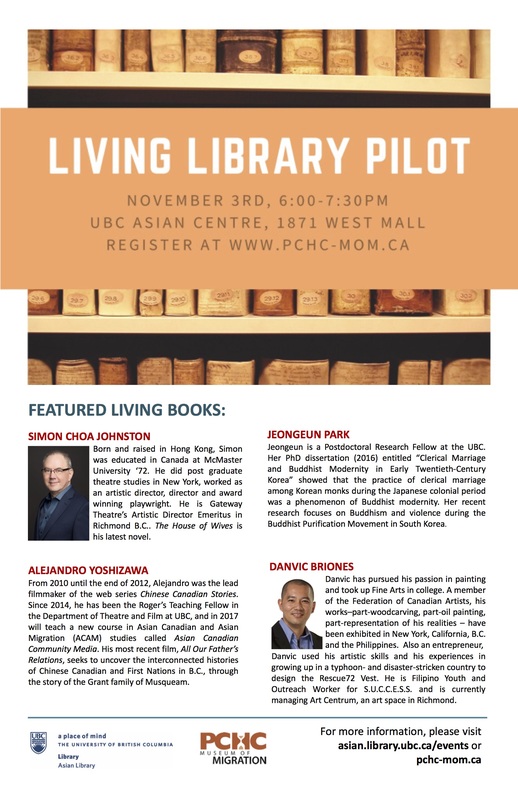 Tags: Living Library, PCHC-MoM, UBC Asian Library. Bookmark the permalink.